Our focus is to develop and implement strategies that are practical, sustainable and allow organizations to achieve their full potential. Our consultants have long histories of working closely with senior executive teams of firms of all sizes to help their companies not only be successful, but achieve performance that stands out relative to peers. Contact Bill at insight@energy-cg.com to find out how we can help you. 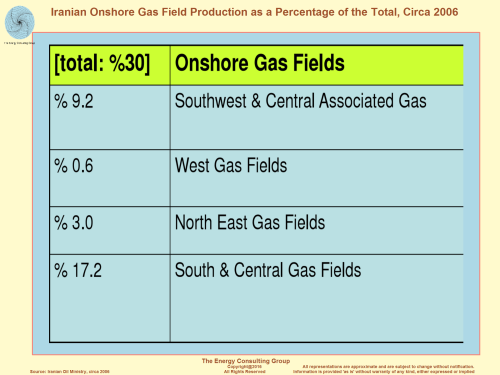 Venezuela Oil and Gas Industry Overview Deep Utica Dry Gas- Emergence of a "super" productive shale play. 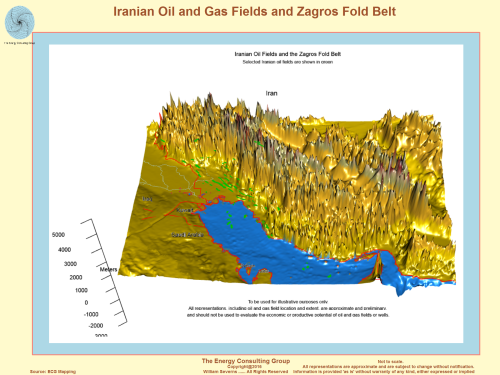 Iran holds the world's fourth-largest proved crude oil reserves and the world's second-largest natural gas reserves. Despite the country's abundant reserves, Iran's crude oil production has substantially declined, and natural gas production growth has been slower than expected over the past few years. International sanctions have profoundly affected Iran's energy sector and have prompted a number of cancellations or delays of upstream oil and gas projects. Iran holds some of the world's largest deposits of proved oil and natural gas reserves, ranking as the world's fourth-largest and second-largest reserve holder of oil and natural gas, respectively. Iran also ranks among the world's top 10 oil producers and top 5 natural gas producers. Iran produced almost 3.4 million barrels per day (b/d) of petroleum and other liquids in 2014 and an estimated 5.7 trillion cubic feet (Tcf) of dry natural gas in 2013. The Strait of Hormuz, off the southeastern coast of Iran, is an important route for oil exports from Iran and other Persian Gulf countries. At its narrowest point, the Strait of Hormuz is 21 miles wide, yet an estimated 17 million b/d of crude oil and refined products flowed through it in 2013 (roughly 30% of all seaborne traded oil and almost 20% of total oil produced globally). Liquefied natural gas (LNG) volumes also flow through the Strait of Hormuz. Approximately 3.7 Tcf of LNG was transported from Qatar via the Strait of Hormuz in 2013, accounting for more than 30% of global LNG trade. Iran's oil production has declined substantially, and natural gas production growth has been slower than expected, despite the country's abundant reserves. International sanctions have stymied progress across Iran's energy sector, especially affecting upstream investment in both oil and natural gas projects. The sanctions have prompted a number of cancellations and delays of upstream projects. The United States and the European Union (EU) enacted measures at the end of 2011 and during the summer of 2012 that affected the Iranian energy sector more profoundly than any previously enacted sanctions. The sanctions impeded Iran's ability to sell oil, resulting in a near 1.0-million b/d drop in crude oil and condensate exports in 2012 compared with the previous year. Iran's oil and natural gas export revenue was $118 billion in the 2011/2012 fiscal year (ending March 20, 2012), according to the International Monetary Fund (IMF) In the 2012/2013 fiscal year, oil and natural gas export revenue dropped by 47% to $63 billion. The IMF estimates that Iran's oil and natural gas export revenue fell again in the 2013/2014 fiscal year by 10% to $56 billion.1 The revenue loss is attributed to the sharp decline in the volume of oil exports from 2011 to 2013. 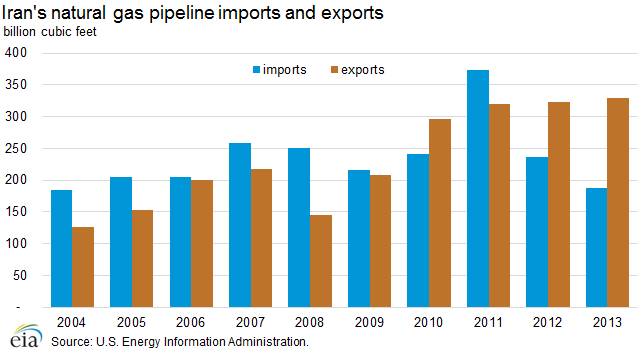 Iran's natural gas exports increased slightly over the past few years. However, Iran exports only a small volume of natural gas, because most of its production is domestically consumed. Nonetheless, international sanctions have also affected Iran's natural gas sector. Iran's natural gas sector has been expanding, but production growth has been lower than expected as a result of the lack of foreign investment and technology. However, in 2014, Iran experienced higher production growth than usual because new phases at the South Pars natural gas field came online.2 The South Pars natural gas field is the largest hydrocarbon upstream project currently being developed in Iran and continues to encounter delays. South Pars, located offshore in the Persian Gulf, holds almost 40% of Iran's proved natural gas reserves.3 It is now being developed mostly by Iranian companies because most international companies have pulled out. The field's development entails 24 phases. Over the past couple of years, there has been progress made during negotiations between Iran and world powers over Iran's nuclear program and international sanctions. 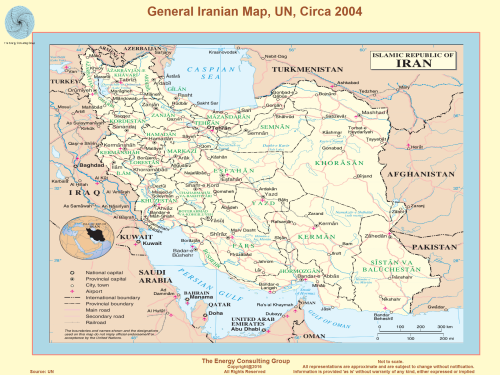 On November 24, 2013, a Joint Plan of Action (JPOA) was established between Iran and the five permanent members of the United Nations Security Council (the United States, United Kingdom, France, Russia, and China) plus Germany (P5+1). Implementation of the JPOA started in January 2014. Under the JPOA, Iran agreed to scale back or freeze some of its nuclear activities during negotiations in exchange for some sanctions relief. The JPOA did not directly allow for additional Iranian oil sales. On April 2, 2015, Iran and the P5+1 reached a framework agreement to guide the next months of negotiations, which targets a comprehensive agreement by June 30, 2015. Under the framework, if a comprehensive agreement is reached, then U.S. and European Union nuclear-related sanctions (which include oil-related sanctions) would be suspended after the International Atomic Energy Agency verifies that Iran complied with key nuclear-related steps. Iran's crude oil and condensate exports started increasing in late 2013 and averaged 1.4 million b/d in 2014, almost 150,000 b/d above the 2013 level, according to U.S Energy Information Administration (EIA) estimates. These estimates are based on data from, Eurostat, Global Trade Information Services, Lloyd's List Intelligence (APEX), and trade press reports. Exports to China and India accounted for almost all of the increase. 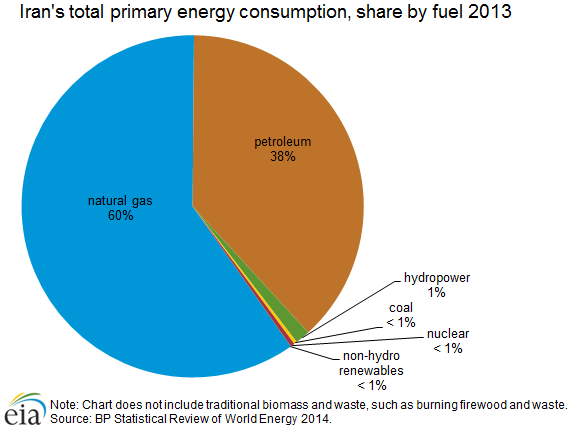 Iran consumed almost 244 million tons oil equivalent of primary energy in 2013.4 Natural gas and oil accounted for almost all (98%) of Iran's total primary energy consumption, with marginal contributions from hydropower, coal, nuclear, and non-hydro renewables. Iran's primary energy consumption has grown by almost 50% since 2004. In order to curtail wasteful energy use and to limit domestic demand growth, Iran has embarked on an energy subsidy reform to raise the prices of domestic petroleum, natural gas, and electricity. The first phase of the reform was enacted in 2010, and the second phase was implemented in 2014. The state-owned National Iranian Oil Company (NIOC) is responsible for all upstream oil and natural gas projects. The Iranian constitution prohibits foreign or private ownership of natural resources. However, international oil companies (IOCs) can participate in the exploration and development phases through buyback contracts. The energy sector is overseen by the Supreme Energy Council, which was established in July 2001 and is chaired by the president of Iran. The council is composed of the Ministers of Petroleum, Economy, Trade, Agriculture, and Mines and Industry, among others. Under the supervision of the Ministry of Petroleum, state-owned companies dominate the activities in the oil and natural gas upstream and downstream sectors, along with Iran's petrochemical industry. The three key state-owned enterprises are the National Iranian Oil Company (NIOC), the National Iranian Gas Company (NIGC), and the National Petrochemical Company (NPC). National Iranian Oil Company (NIOC) NIOC controls oil and natural gas upstream activities, as well as oil downstream activities, through its subsidiaries. National Iranian Gas Company (NIGC) NIGC controls natural gas downstream activities. The company's objective is to process, deliver, and distribute gas for domestic use. NIGC operates through several subsidiaries. National Petrochemical Company (NPC) NPC operates several petrochemical complexes through its subsidiaries. Iran exported 13 million tons of petrochemicals in 2013. 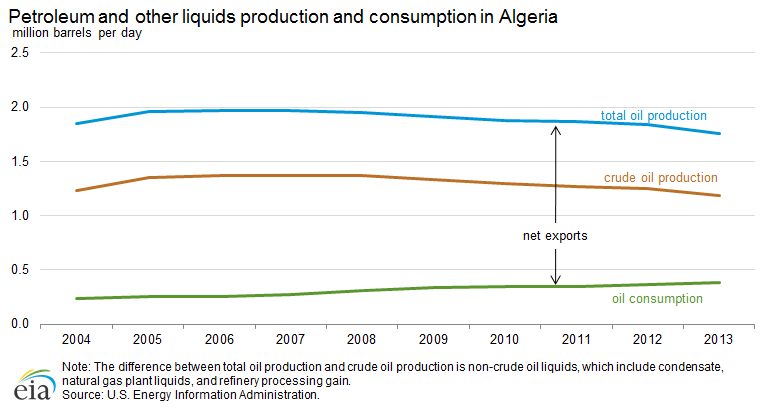 Source: U.S. Energy Information Administration, Facts Global Energy, and Arab Oil and Gas Directory. Iran is planning to change its oil contract model to allow IOCs to participate in all phases of an upstream project, including production. However, international sanctions have affected foreign investment in Iran's energy sector, limiting the technology and expertise needed to expand capacity at oil and natural gas fields. Iran recently announced a new oil contract model called the Iranian (or Integrated) Petroleum Contract (IPC), although it is not yet finalized and is subject to change. The purpose of the new framework is to attract foreign investment with a contract that contains terms similar to a PSA. 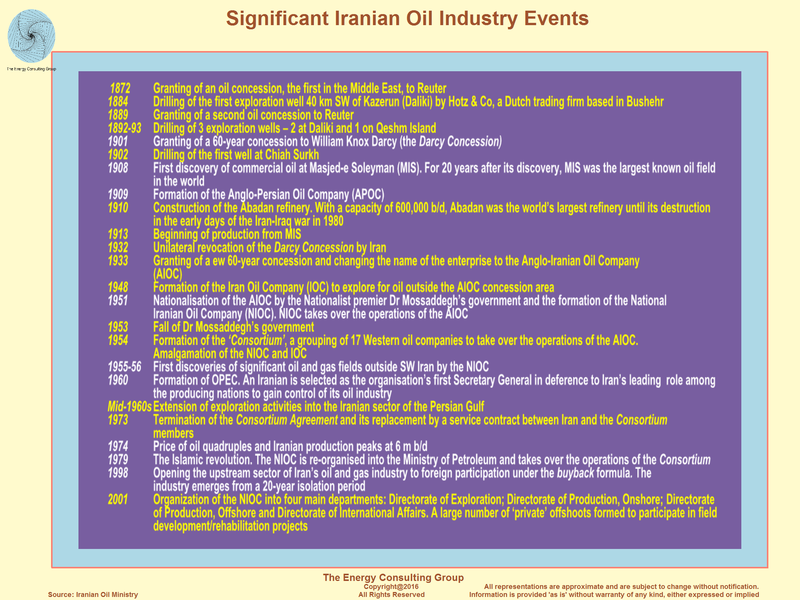 Some of the main criticisms of the buyback contracts include lack of flexibility of cost recovery and, in some cases, the NIOC's limited expertise to reverse field decline rates in comparison to the IOC that developed the field. 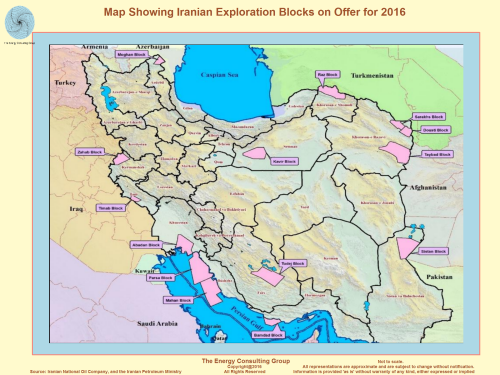 International sanctions have affected Iran's energy sector by limiting the foreign investment, technology, and expertise needed to expand capacity at oil and natural gas fields and to reverse declines at mature oil fields. Iran has had to depend mainly on local companies to develop oil and gas fields in recent years. 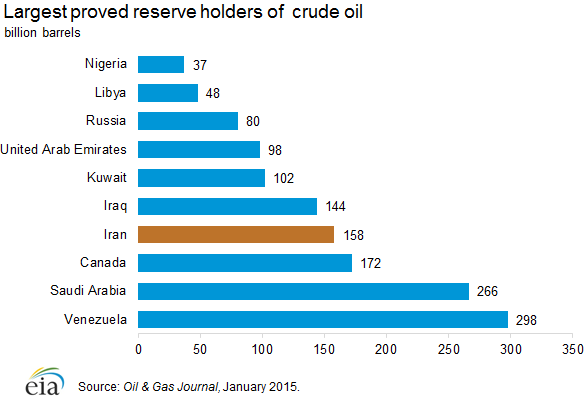 Iran holds almost 10% of the world's crude oil reserves and 13% of OPEC reserves. About 70% of Iran's crude oil reserves are located onshore, with the remainder mostly located offshore in the Persian Gulf. 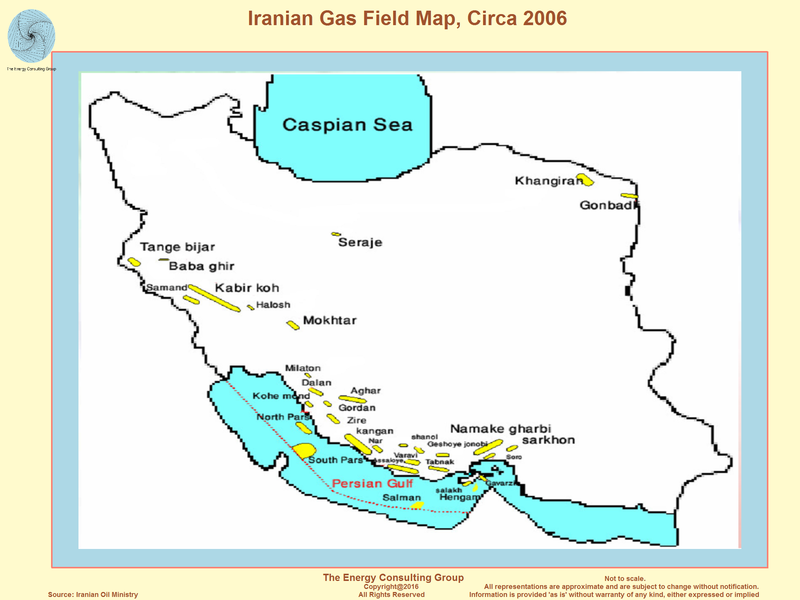 Iran also holds proved reserves in the Caspian Sea, although exploration has been at a standstill. According to FGE, approximately 70% of Iran's crude oil reserves are located onshore and the remainder offshore, mostly in the Persian Gulf.11 Iran also has proved and probable oil reserves of approximately 500 million barrels mostly offshore in the Caspian Sea, but exploration and development of these reserves have been at a standstill because of territorial disputes with neighboring Azerbaijan and Turkmenistan. Iran also shares a number of onshore and offshore fields with neighboring countries, including Iraq, Qatar, Kuwait, and Saudi Arabia. Iran produced 3.4 million b/d of petroleum and other liquids in 2014, of which 2.8 million b/d was crude oil and the remainder was condensate and natural gas plant liquids. Iran's crude oil production fell dramatically from nearly 3.7 million b/d in 2011 to 2.7 million b/d in 2013 because of sanctions. Iran is one of the founding members of the Organization of the Petroleum Exporting Countries (OPEC), which was established in 1960. 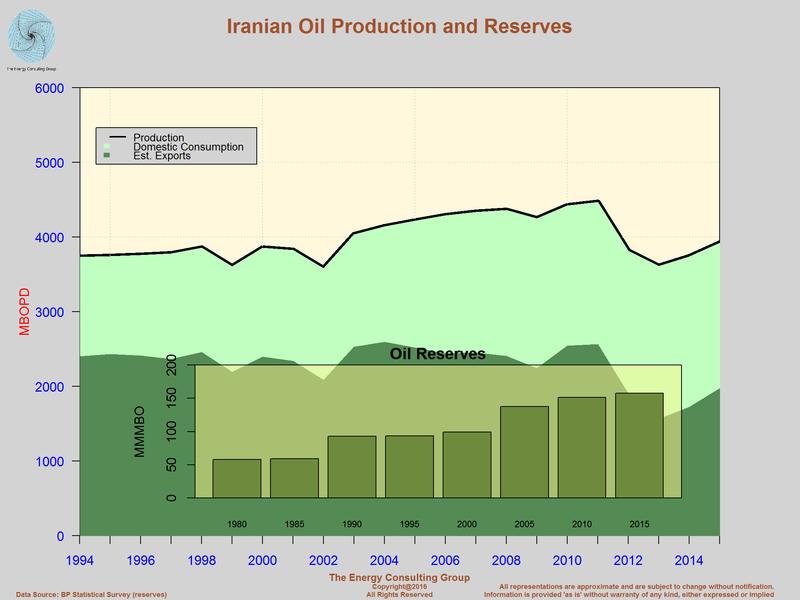 Since the 1970s, Iran's oil production has varied greatly. Iran averaged production of more than 5.5 million b/d of oil in 1976 and 1977, with production topping 6.0 million b/d for most of the period. 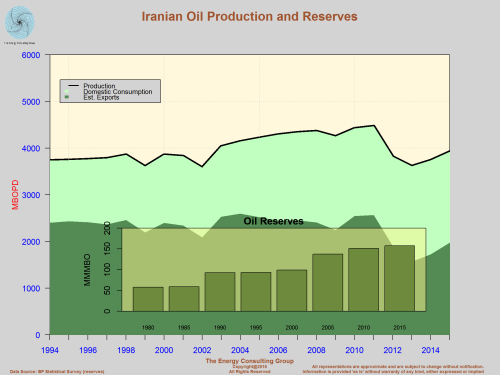 Since the 1979 revolution, however, a combination of war, limited investment, sanctions, and a high rate of natural decline in production of Iran's mature oil fields has prevented a return to such production levels. In recent years, a series of sanctions targeting the oil sector have resulted in cancellations of new projects by a number of foreign companies, while also affecting existing projects. Following the implementation of sanctions in late-2011 and mid-2012, Iranian production dropped dramatically from almost 3.7 million b/d in 2011 to 2.7 million b/d in 2013. Although Iran had been subject to four earlier rounds of United Nations sanctions, the tougher measures imposed by the United States and the EU severely hampered Iran's ability to export its oil, which affected Iran's oil production. The U.S. and EU measures targeted Iran's petroleum exports and imports, prohibited large-scale investment in the country's oil and gas sector, and cut off Iran's access to European and U.S. sources for financial transactions. Further sanctions were implemented against institutions targeting the Central Bank of Iran, while the EU imposed an embargo on Iranian oil and banned European Protection and Indemnity Clubs (P&I Clubs) from providing Iranian oil tankers with insurance and reinsurance. In 2014, Iran produced almost 3.4 million b/d of petroleum and other liquids (total oil), of which roughly 2.8 million b/d was crude oil, and the remainder was condensate and natural gas plant liquids (NGPL). Iran's total oil production level in 2014 was nearly 200,000 b/d higher than in 2013, but still about 800,000 b/d lower than the production level of 4.2 million b/d in 2011. Sanctions and unfavorable contractual terms have impeded the necessary investment needed to increase Iran's production capacity. Most of Iran's crude oil is generally medium in sulfur content and in the 29° to 36° API gravity range. Two crude streams, Iran Heavy and Iran Light, account for more than 80% of the country's crude oil production capacity. 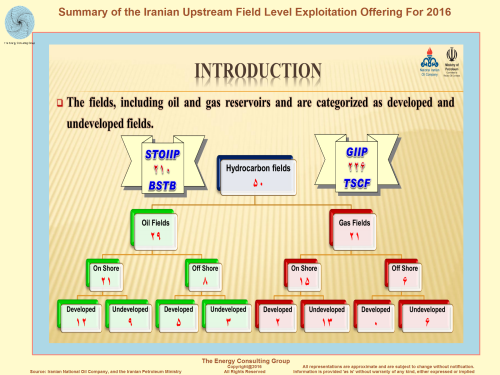 Both crude streams are sourced from onshore fields, many of which are older fields experiencing natural decline.12 According to the International Energy Agency, about half of Iran's production is sourced from oil fields that are more than 70 years old, which include the Ahwaz-Asmari, Marun, and Gachsaran fields.13 The NIOC has been working on offsetting declines at aging fields through the use of EOR techniques, mainly by reinjecting associated gas into oil wells to improve oil recovery rates. Other crude streams include Froozan, Soroush/Norouz, Doroud, Sirri, and the Lavan Blend. There were a number of new exploration and development blocks announced over the past several years that could provide Iran with an increase in its crude oil production capacity, but sanctions have negatively affected the Iranian oil industry. Virtually all western companies have halted their activities in Iran, although some Chinese and Russian companies are still participating. The sanctions and lack of international involvement have particularly affected upstream projects, as the lack of expertise, technology, and investment has resulted in delays and, in some cases, cancellations of projects. Nonetheless, development of a few projects continues, albeit at a much slower pace than originally planned. The Yadavaran, South Azadegan, and Forouzan fields are currently producing crude oil, but below their plateau levels. CNPC is China National Petroleum Corporation. PEDCO is PetroIran Development Company. Sinopec is China Petroleum & Chemical Corporation. Iran's exports of crude oil and condensate dropped from 2.6 million b/d in 2011 to almost 1.3 million b/d in 2013 as a result of U.S. and European Union sanctions that targeted Iran's oil exports. Iran's exports increased by nearly 150,000 b/d to 1.4 million b/d in 2014. The largest buyers of Iranian crude and condensate are China, India, Japan, South Korea, and Turkey. 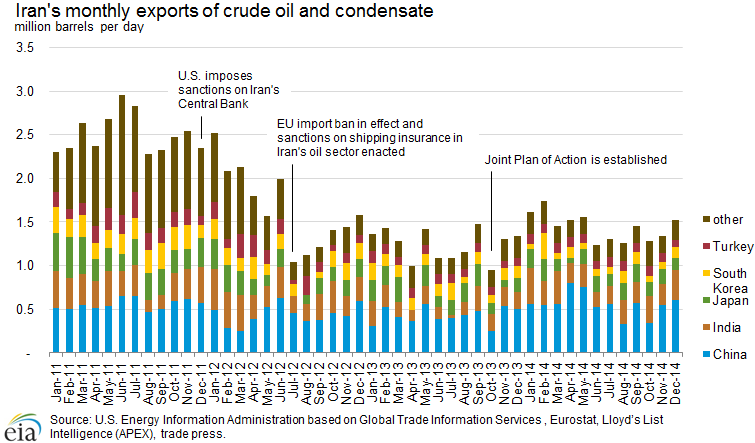 According to EIA estimates based on data from Eurostat, Global Trade Information Services, Lloyd's List Intelligence (APEX), and trade press reports, Iran's crude oil and condensate exports averaged 1.4 million b/d in 2014, 1.2 million b/d less than the volume exported in 2011 but almost 150,000 b/d above the 2013 export level. China and India accounted for nearly all of the year-over-year increase. Iran's ability to sell oil was substantially impeded by new sanctions imposed by the United States and the European Union, that went into effect in the summer of 2012. The decline of Iran's crude oil and condensate exports is attributed to new sanctions imposed by the United States and the EU at the end of 2011 and during the summer of 2012. 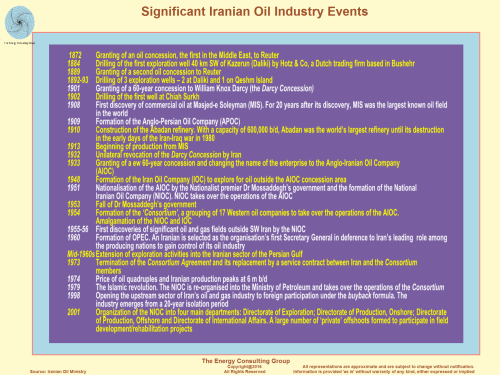 Iran's ability to sell crude oil was particularly affected by the EU ban on all Iranian petroleum imports as well as the imposition of insurance and reinsurance bans by European P&I Clubs effective July 1, 2012. European insurers underwrite the majority of insurance policies for the global tanker fleet. The insurance ban particularly affected Iranian oil exports, as lack of adequate insurance impeded the sales of Iranian crude to all of its customers, including those in Asia. Iranian exports dropped to about 1.0 million b/d in July 2012 as Japanese, Chinese, South Korean, and Indian buyers scrambled to find insurance alternatives. Adding to the insurance difficulties was continued pressure imposed by the U.S. sanctions on Iranian oil customers to decrease their purchases. Iran and the countries that are continuing to import Iranian oil have since been able to find alternatives to P&I coverage from EU companies. By the last quarter of 2012, Iranian exports recovered somewhat as Japan, South Korea, and India began to issue sovereign guarantees for vessels carrying Iranian crude oil and condensate. China and India began to accept the Iranian Kish P&I Club guarantee on vessels that shipped oil to its refineries. Nonetheless, Iranian exports have failed to reach export levels that existed before the latest sanctions. In 2012, sanctions were not the only driver of export decreases. For example, commercial interests contributed to the decrease in China's imports, as Chinese buyers were engaged in a contractual dispute with Iran in the first quarter of 2012. Chinese refiners significantly decreased their purchases of Iranian crude and condensate as a result of a dispute over the terms of annual purchase contracts. Although Unipec (the trading arm of China's largest refiner Sinopec Corporation) eventually signed a supply contract with NIOC for volumes comparable to those imported in 2011, the contract did not allow NIOC to make up for the oil sales that were not delivered to China in the first quarter of that year. In addition to crude oil and condensate, Iran also exports petroleum products. According to FGE, Iran exported almost 300,000 b/d of petroleum products in 2014, more than 50,000 b/d higher than in 2013 but about 100,000 b/d lower than in 2011 because U.S. and EU sanctions affected Iran's ability to sell petroleum products as well.16 Iran mostly exports fuel oil, LPG, and naphtha to Asian markets. The terminals at Kharg, Lavan, and Sirri Islands, located in the Persian Gulf, handle almost all of Iran's crude oil exports. 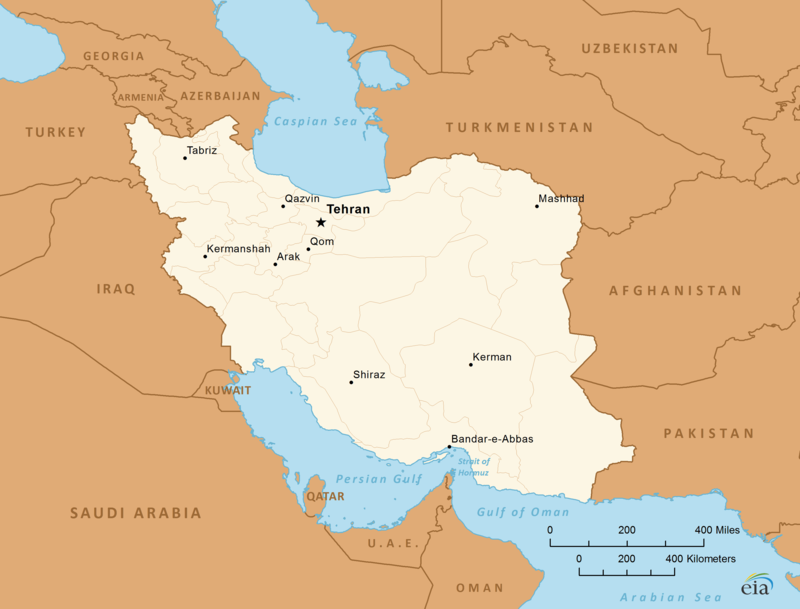 Iran also has two small crude oil terminals at Cyrus and Bahregansar, one terminal along the Caspian Sea, and other terminals that handle mostly refined product exports and imports. Condensate from the South Pars natural gas field is exported from the Assaluyeh terminal. Neka is Iran's Caspian Sea port that was built in 2003 to receive crude oil imports from the Caspian region producers under swap agreements. The port has a storage capacity of 1 million barrels and can handle 100,000 b/d of crude oil, according to FGE.20 The terminal, which has not operated since 2011, was previously used to facilitate swap agreements with Azerbaijan, Kazakhstan, and Turkmenistan. Under these agreements, Iran received crude oil at its Caspian Sea port of Neka, which was processed in the Tehran and Tabriz refineries. In return, Iran exported the same amount of crude oil through its Persian Gulf ports.21 There have been talks to revive the swaps, but it is unclear when they might restart. The export terminals Bandar Mahshahr and Abadan (also known as Bandar Imam Khomeini) are near the Abadan refinery and are used to export refined product from the Abadan refinery. Bandar Abbas, located near the northern end of the Strait of Hormuz, is Iran's main fuel oil export terminal. Iran is the second-largest oil-consuming country in the Middle East after Saudi Arabia. Over the past few years, Iran has expanded its domestic refining capacity to meet growing domestic demand, particularly for gasoline. Almost all of Iran's domestic oil consumption was of locally produced products. In the past, Iran had limited domestic oil refining capacity and was dependent on imports of refined products, especially gasoline, to meet domestic demand. In response to international sanctions and the resulting difficulty in purchasing refined products, Iran expanded its domestic refining capacity. As of December 2014, Iran's total crude oil distillation capacity was slightly more than 2.0 million b/d, according to FGE.23 Iran also extracts petroleum products at natural gas processing plants (naphtha and liquefied petroleum gas). A small amount of crude oil, approximately 4,000 b/d, is directly burned for power generation. Iran's energy prices are subsidized, particularly gasoline prices. At the end of 2010, the government initiated the first phase of the subsidy reform, decreasing the subsidies on energy prices to discourage waste. Phase II of the subsidy reform was implemented in April 2014. According to FGE, gasoline prices have increased by 43% for the free-market price and by 75% for the subsidized price.24 The subsidy reform also includes phasing out subsidies for natural gas. 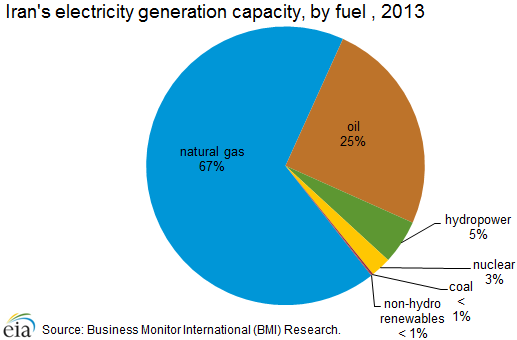 Source: Facts Global Energy, December 2014. 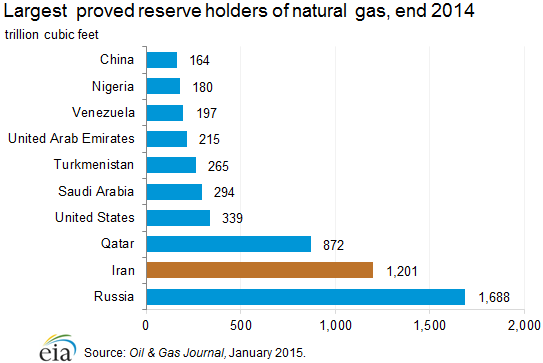 Iran is the second-largest proved natural gas reserve holder in the world, behind Russia. 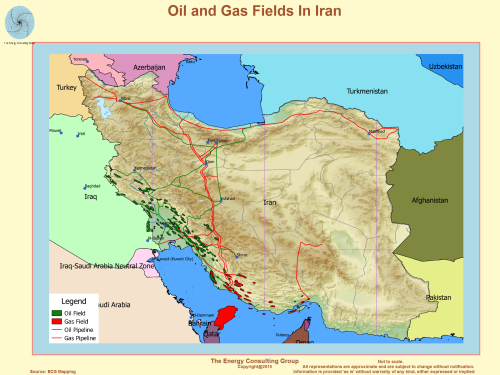 Iran holds 17% of the world's proved natural gas reserves and more than one-third of OPEC's reserves. Iran's largest natural gas field, South Pars, is estimated to hold almost 40% of Iran's gas reserves. 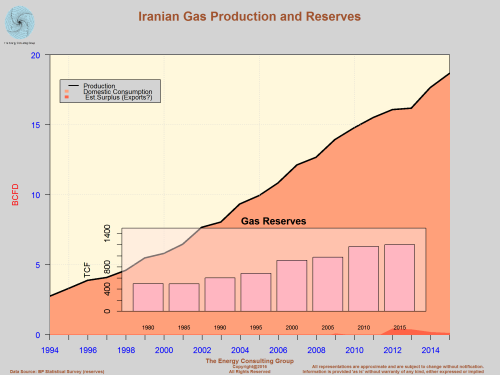 Most of Iran's natural gas reserves are undeveloped. 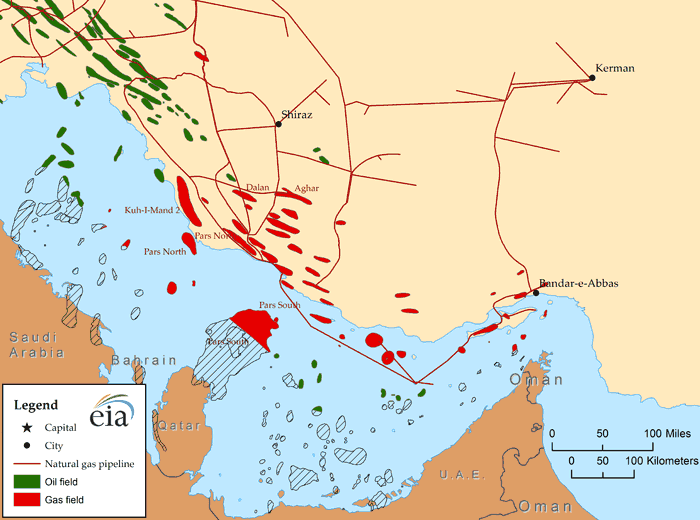 Iran's largest gas field is South Pars, a nonassociated gas field located offshore in the middle of the Persian Gulf. South Pars is a portion of a larger gas structure that straddles the territorial water borders of Iran and Qatar. It is called the North field in Qatar. 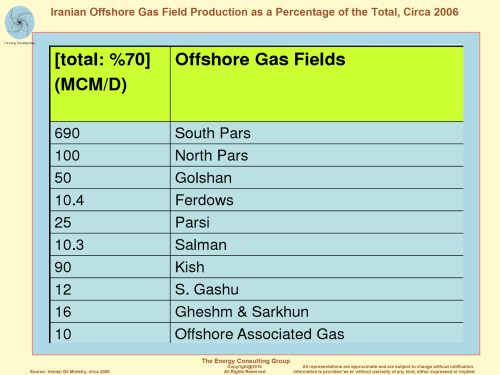 South Pars reserves account for almost 40% of Iran's total natural gas reserves, and the field is also estimated to hold 17 million barrels of condensate in place.28 Other major gas fields in Iran include: Kish, North Pars, Tabnak, Forouz, and Kangan. These fields and others also hold large amounts of condensate reserves. 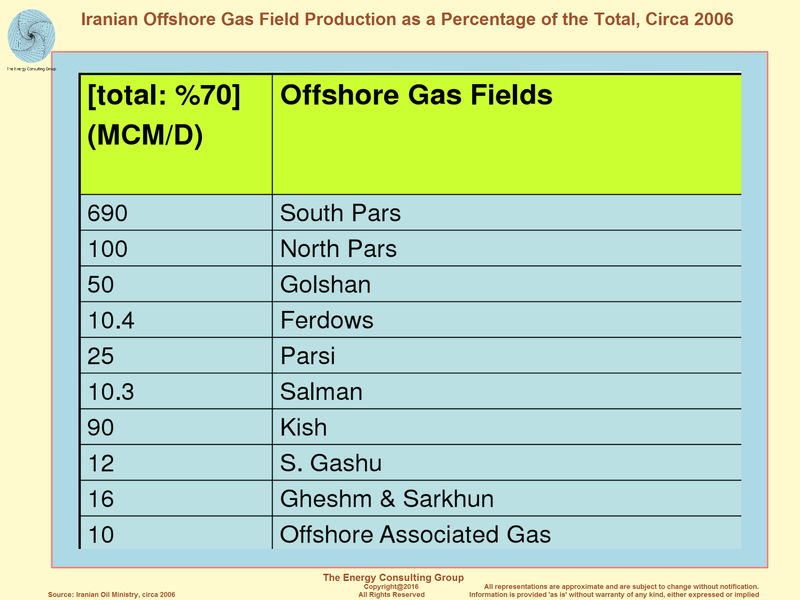 Iran's Caspian basin gas reserves, at 2 Tcf, contribute very little to the nation's total reserves. Iran is the world's third-largest dry natural gas producer, after the United States and Russia. Despite repeated delays in field development and the effects of sanctions, Iran's natural gas production is expected to increase in the coming years as new phases of the South Pars gas field come online. In 2013, Iran became the world's largest gas-flaring country, surpassing Russia. Gross natural gas production totaled almost 8.1 Tcf in 2013, 1% lower than the previous year's level. 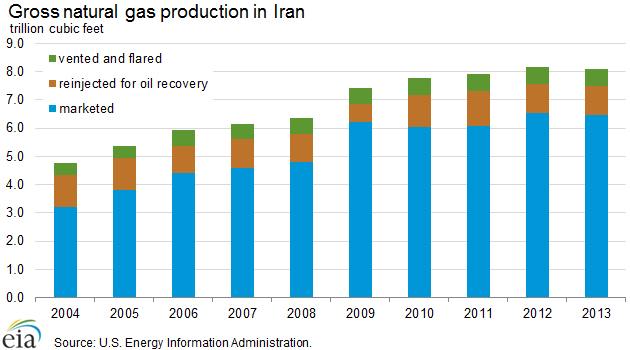 Iran's natural gas production increased in 2014, although estimates are still preliminary. Of the 8.1 Tcf produced, most of it was marketed (6.5 Tcf), and the remainder was reinjected into oil wells to enhance oil recovery (1.0 Tcf) or vented and flared (0.6 Tcf). Reinjecting natural gas plays a critical role in oil recovery at Iran's fields. As a result, natural gas reinjection is expected to increase in the coming years. Some estimates indicate that NIOC will require between 2.0 and 2.5 Tcf per year of natural gas for reinjection into its oil fields in the next decade.29Iran also flares (burns off) a substantial portion of its gross production. Iran became the world's largest gas-flaring country in 2013, surpassing Russia. Gas is flared because of the lack of infrastructure to capture and transport gas associated with oil production. Dry natural gas production is a subset of marketed production. Marketed production includes dry natural gas, liquid hydrocarbons, and natural gas used in field and processing plant operations. In 2013, 80% of the gross natural gas production was marketed as dry gas. 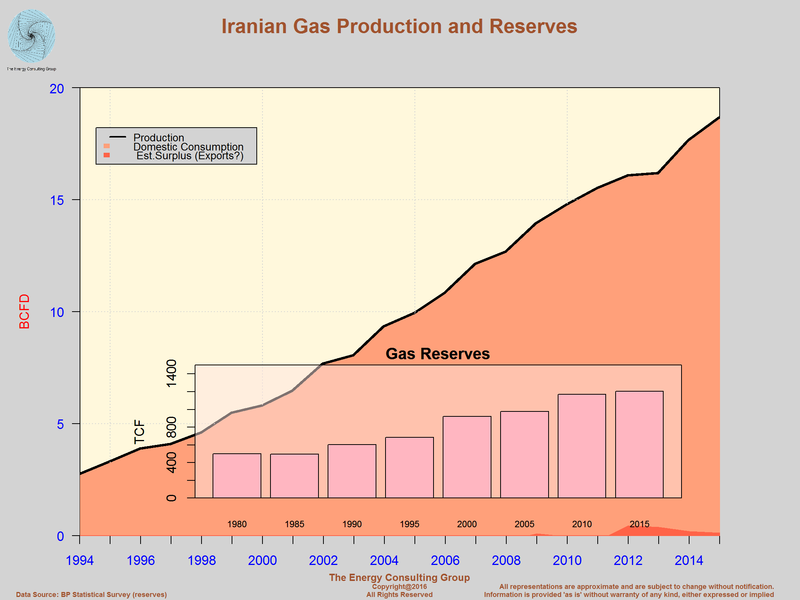 Iran's dry natural gas production has rapidly increased to almost 5.7 Tcf in 2013, almost double the amount produced 10 years ago. Iran is the world's third-largest dry natural gas producer, after the United States and Russia. Most of Iran's production is consumed domestically. Domestic consumption has increased as production has increased, totaling almost 5.6 Tcf in 2013. Much like in the oil sector, the natural gas sector has been hampered by international sanctions. Additionally, lack of foreign investment and insufficient financing have resulted in slow growth in Iran's natural gas production. Iran was expected to become one of world's leading natural gas producers and exporters, given the country's vast proved reserves of natural gas, which rank the second largest in the world. However, development of its fields has been hampered by financing, technical, and contractual issues, according to the Arab Oil and Gas Journal.30 Nonetheless, Iran's natural gas production has grown, and output is likely to continue to increase in the coming years as new phases of the South Pars gas field come online. Natural gas production from South Pars is critical to meet increasing domestic consumption and Iran's current and future export obligations. The entire project is managed by Pars Oil & Gas Company (POGC), a subsidiary of NIOC. Each of the 24 phases has a combination of natural gas with condensate and/or natural gas plant liquids (NGPL) production. Production from phases 1 to 10 was originally designed to be allocated for the domestic market for consumption and reinjection. Natural gas produced from the remaining phases was planned for export via pipelines and as liquefied natural gas (LNG) and/or used for proposed gas-to-liquids (GTL) projects. However, there are no firm plans to build an LNG export facility in Iran. Currently, phases 1 to 10 and phase 12 are complete, and phases 15-18 are partially complete and have started to produce some natural gas. Phases 15 and 16 are near complete and will eventually produce at their full capacity of 2 Bcf/d of natural gas and 80,000 b/d of condensate. 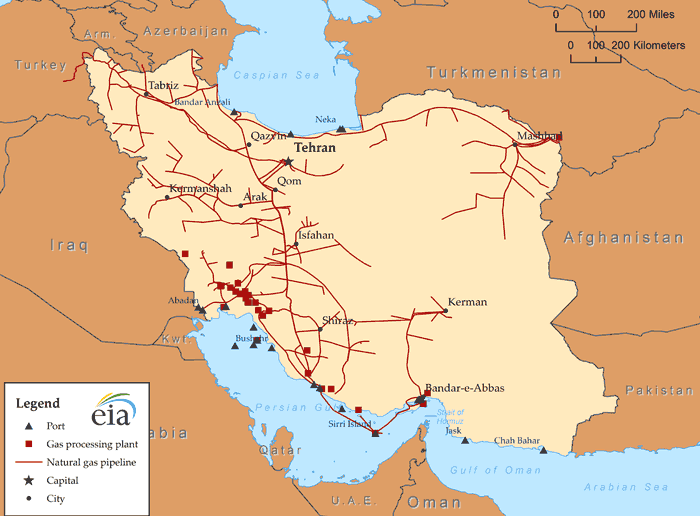 Iran trades marginal amounts of natural gas regionally via pipelines. In 2013, more than 90% of Iran's imports came from Turkmenistan, and more than 90% of Iran's exports went to Turkey. Iran does not have the infrastructure in place to export or import liquefied natural gas (LNG). Iran accounts for less than 1% of global natural gas trade and is not a significant natural gas exporter, as explained in an EIA report on Natural Gas Exports from Iran. In 2013, Iran exported 329 Bcf and imported 188 Bcf of dry natural gas, both via pipelines. Iran relies on imports particularly during winter months when residential space-heating demand peaks during colder weather. Iran does not have the infrastructure to export or import liquefied natural gas (LNG). Iran's natural gas imports declined in 2012 from the previous year (by more than 35%) and in 2013 (by 21%), reflecting much lower volumes imported from Turkmenistan. The U.S. and EU sanctions interfered with transactions between Turkmenistan and Iran in 2012 and 2013, resulting in the decline of Turkmen gas imports.33 In 2011, Iran received almost 30% of Turkmenistan's natural gas exports, but the share dropped to less than 12% in 2013, according to BP Statistical Review of World Energy.34 Nonetheless, more than 90% of Iran's natural gas imports still came from Turkmenistan in 2012 and 2013, and the remainder from Azerbaijan. Imports of Turkmen natural gas are essential to Iran's ability to meet both seasonal peak demand and industrial demand in northern Iran. Iran exports natural gas to Turkey, Armenia, and Azerbaijan. More than 90% of Iranian exports went to Turkey in 2013, and the remainder went to Azerbaijan and Armenia. Armenia uses most of its imported Iranian natural gas to produce electricity at the Hrazdan power plant. In return, excess baseload electricity generated from the Armenian Nuclear Power Plant is exported to Iran. 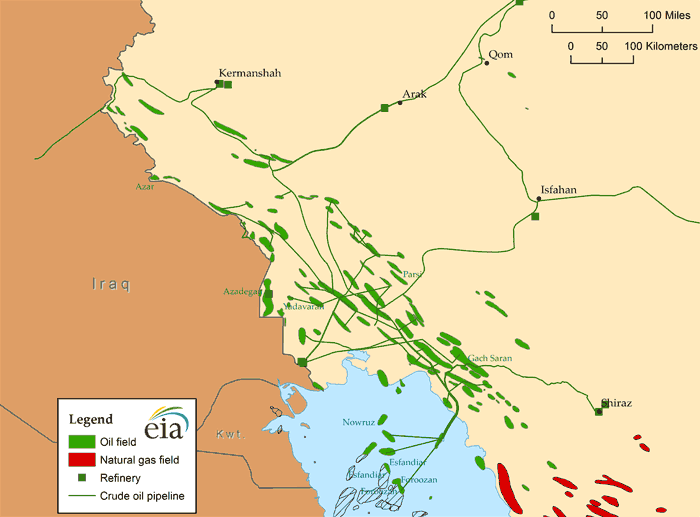 Iran exports natural gas to the isolated Azerbaijani exclave of Nakhchivan via the Salman-Nakhchivan pipeline. In exchange, Azerbaijan exports natural gas to Iran's northern provinces via the Astara-Kazi-Magomed pipeline. Although Iran's aspirations to build a liquefaction facility date back to the 1970s, the country has yet to build one. The NIOC started construction projects in the past to build an LNG export plant, but most of the work has been halted, mainly because of the lack of technology and foreign investment, stemming from international sanctions that made it impossible to obtain financing and to purchase necessary technology. Given the political constraints, Iran's LNG projects are years away from completion. Iran has the potential to become an important gas supplier to its region, and has established agreements with some of its neighboring countries to export natural gas via planned regional pipelines. However, there are several challenges related to Iran's natural gas sector that may complicate volumes expected from these projects. Some of these challenges include: Iran's growth in natural gas demand; Iran's reliance on its natural gas to augment oil recovery by reinjecting it into oil wells; international sanctions that have hindered Iran's access to technology and foreign investment; and some disagreements between Iran and potential buyers over natural gas prices. Iran-UAE Gas Contract: The Iran-United Arab Emirates (UAE) natural gas contract outlined an agreement to transport natural gas from the Salman field to Sharjah in UAE. Contract negotiations were not concluded because of a pricing and volume dispute, and the contract was referred to international arbitration. Iran's increasing domestic demand for electricity has created supply shortfalls during times of peak energy demand. Iran recently increased electricity prices, which is a component of its energy subsidy reform, in hopes of limiting demand growth. Natural gas is the country's primary fuel source to generate electricity, accounting for almost 70% of total generation in 2013. In 2013, Iran generated almost 224 billion kilowatthours (kWh) of electricity, of which 92% was from fossil-fuel sources.40 Natural gas is the largest source of fuel for electricity generation in Iran, accounting for almost 70% of total generation. Hydropower, nuclear, and nonhydro renewables make up the remaining fuel sources used to generate electricity in Iran. As a part of Iran's energy subsidy reform, the Iranian government announced in early 2014 that electricity prices would increase by 25% and that in 2015 prices would increase again by another 20% to, in part, scale back subsidies.41 The government hopes that the price increase will ease consumption growth and pressure on its generation system, particularly during peak demand times. Nonetheless, Iran's electricity consumption is expected to continue to grow, and to be met by new generation from natural gas, nonhydro renewable resources, and nuclear power. Iran's energy ministry proposed plans to construct 35 new dispersed power stations, with an estimated cost of $250 million.42 The increase in electricity generation is expected to be used for domestic consumption, but Iran also has ambitious plans to increase electricity exports to neighboring countries. Iran exported 11 billion kWh of electricity in 2012, about a 25% increase from the previous year. In 2012, Iran imported 3.9 billion kwh of electricity, 7% more than the previous year. Iran exports electric power to Armenia, Pakistan, Turkey, Iraq, and Afghanistan. Azerbaijan and Armenia supply electricity to Iran under a swap agreement. Data presented in the text are the most recent available as of June 19, 2015. 1International Monetary Fund, Islamic Republic of Iran, (April 14, 2014), IMF Country Report No. 14/93, page 36. 2Middle East Economic Survey, "Iran Beats the Odds with 20% Gas Output Hike," (March 13, 2015), Volume 58, Issue 11. 3Â Facts Global Energy, Iran's Oil and Gas Annual Report 2014, (December 19, 2014), page 37. 4BP Statistical Review of World Energy 2014, Excel workbook of historical data, 2014. 5Clyde&Co, "Iran's new Integrated Petroleum Contracts," (May 11, 2014), page 2. 6Facts Global Energy, Iran's Oil and Gas Annual Report 2014, (December 19, 2014), page 12. 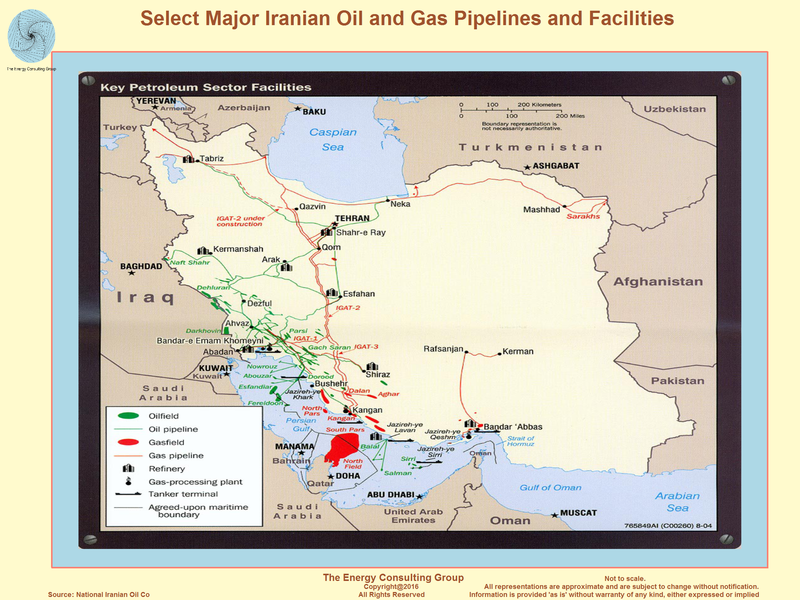 7Middle East Economic Survey, "Iran Lays Groundwork for $100Bn Oil Sector Investment," (February 28, 2014). 8Clyde&Co, "Iran's new Integrated Petroleum Contracts," (May 11, 2014), page 3. 9Oil & Gas Journal, Worldwide look at reserves and production, (January 1, 2015). 10Clyde&Co, "Iran's new Integrated Petroleum Contracts," (May 11, 2014). 11Facts Global Energy, Iran's Oil and Gas Annual Report 2014, (December 19, 2014), page 15. 12Facts Global Energy, Iran's Oil and Gas Annual Report 2014, (December 19, 2014), page 19. 13International Energy Agency, Medium-Term Oil Market Report, 2015, page 53. 14Facts Global Energy, Middle East Oil Databook: Middle East Crude Oil Balances, (October 2014). 15Arab Oil & Gas Directory, www.stratener.com, Iran, (2014), page 141. 16Facts Global Energy, Iran's Oil and Gas Annual Report 2014, (December 19, 2014), page 35-36. 17TankWorld News, "World's Largest Floating Oil Terminal launches in Iran," (February 9, 2015), and Iran Daily, "Kharg oil tanks ready to store 4m barrels," (November 6, 2014). 18Facts Global Energy, Iran's Oil and Gas Annual Report 2014, (December 19, 2014), page 26. 19Arab Oil & Gas Directory, www.stratener.com, Iran, (2014), page 131. 20Facts Global Energy, Iran's Oil and Gas Annual Report 2014, (December 19, 2014), page 27. 21Arab Oil & Gas Directory, www.stratener.com, Iran, (2014), page 130. 22Facts Global Energy, Iran's Oil and Gas Annual Report 2014, (December 19, 2014), page 36. 23Facts Global Energy, Iran's Oil and Gas Annual Report 2014, (December 19, 2014), page 30. 24Facts Global Energy, Iran Oil and Gas Monthly Report, (April 30, 2014). 25Oil & Gas Journal, Worldwide look at reserves and production, (January 1, 2015). 26Facts Global Energy, Iran's Oil and Gas Annual Report 2014, (December 19, 2014), page 37. 27Arab Oil & Gas Directory, www.stratener.com, Iran, (2014), page 132. 28Facts Global Energy, Iran's Oil and Gas Annual Report 2014, (December 19, 2014), page 37. 29Facts Global Energy, Iran's Oil and Gas Annual Report 2014, (December 19, 2014), page 42. 30Arab Oil & Gas Directory, www.stratener.com, Iran, (2014), page 133. 31Facts Global Energy, Iran's Oil and Gas Annual Report 2014, (December 19, 2014), page 37-38. 32Arab Oil & Gas Directory, www.stratener.com, Iran, (2014), page 134. 33Facts Global Energy, Iran's Oil and Gas Annual Report 2014, (December 19, 2014), page 54. 34BP Statistical Review of World Energy 2014, Excel workbook of historical data, 2014. 35LNG World News, "Iran-Iraq gas pipeline almost complete," (February 10, 2015). 36Facts Global Energy, Iran's Oil and Gas Annual Report 2014, (December 19, 2014), page 52-53. 37Reuters, "Iran says seals gas export deal with Oman," (March 12, 2014). 38Facts Global Energy, Iran's Oil and Gas Annual Report 2014, (December 19, 2014), page 52. 39Facts Global Energy, Iran's Oil and Gas Annual Report 2014, (December 19, 2014), page 51-52. 40Business Monitor International (BMI) Research, Iran Power Report Q2 2015, (March 2015), page 11. 41Business Monitor InternationalÂ (BMI) Research, Iran Power Report Q2 2015, (March 2015), page 8. 42Business Monitor InternationalÂ (BMI) Research, Iran Power Report Q2 2015, (March 2015), page 8. 43Business Monitor InternationalÂ (BMI) Research, Iran Power Report Q2 2015, (March 2015), page 33. 44Business Monitor InternationalÂ (BMI) Research, Iran Power Report Q2 2015, (March 2015), page 17. 45World Nuclear Association, Nuclear Power in Iran, (April 2015).